UPS is making use of a new battery charging technology that will allow it to increase the number of electric vehicles operating from its central London site from 65 to all 170 trucks based there. The new system is based on a smart grid which uses a central server connected to each EV charge post as well as the grid power supply and the on-site energy storage. The scheme is the result of the ‘Smart Electric Urban Logistics (SEUL)’ project with UK Power Networks and Cross River Partnership, with funding from the UK’s Office for Low Emission Vehicles. “UPS thinks this is a world first, right in the heart of a mega-city. 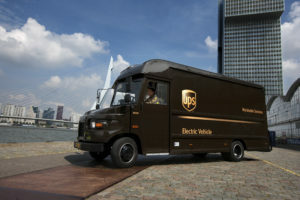 We are using new technology to work around some big obstacles to electric vehicle deployment, heralding a new generation of sustainable urban delivery services both here in London and in other major cities around the world,” said Peter Harris, director of sustainability, UPS Europe. Part of the initiative is the use of onsite energy storage batteries. Although new batteries have been deployed at this stage, it is envisaged that in the future these could be second-life batteries that have already been used in a UPS EV. Together with the smart-grid, this will pave the way toward a UPS EV infrastructure strategy that can dynamically make use of a conventional power upgrade, a smart grid, onsite storage, and in many cases, local power generation including solar and other alternative sources. UPS says this approach allows it to tailor the lowest cost approach building by building and determine how best to adopt and charge a fully electric fleet. This will be accomplished by combining a variety of solutions including conventional power grid upgrade, smart grid, on-site energy storage with batteries and local power generation (using, for example, solar energy generated on facility roof tops). “Electric vehicles are an integral component within UPS’s alternative fuel and advanced technology fleet. Our collaboration with UK Power Networks and Cross River Partnership marks a major turning point in the cost effective deployment of electric vehicles which in turn will play a key role in ensuring the global trend toward urbanization is sustainable. We are applying new technology to make the charging process smarter and our delivery service cleaner,” said Harris.